The plan today is to get up early and go to Islands of Adventure. Well, you know what they say about the best laid plans. India wakes up in the night and is sick. She continues to be sick at least half a dozen times during the night and again in the morning. Islands of Adventure is put on hold. Tammy and I jump in the car and drive to the Crossroads to pick up a few groceries (and beer) and to get India something to settle her stomach. While out we visit the World of Denim and pick up some jeans for ourselves. I get a pair of 501's for $29.99, a real bargain compared to UK prices. On return India is still really bad, so Grandma and Georgia go for a walk around and to visit the playground while Tam and I shut the curtains and try to keep as quiet as possible while India catches up on some much needed sleep. Tam soon falls asleep as well, so I leave them to it and catch up with Grandma and Georgia who have been having a rare old time of it in the playground. They have being playing hide-and-seek and tag. I suspect that Georgia wanted to stop playing long ago but Grandma is having too much fun. We head off to Muddy Rivers (the bar by the swimming pool) and enjoy ham subs and beers while sitting in the rocking chairs on the porch. Georgia wants to go swimming so Grandma stays with her while I wander off for a look around. This turns into a wonderful hour just strolling around and video taping in Magnolia Terrace. The sun is shining and there is a lovely warm breeze blowing. The more I visit WDW the more I think that this is an enormous part of the pleasure for me now. Not just the theme parks or water parks or Pleasure Island but the beauty and tranquillity of the resorts and other areas. The two areas of Dixie Landings are very different in appearance and feel. 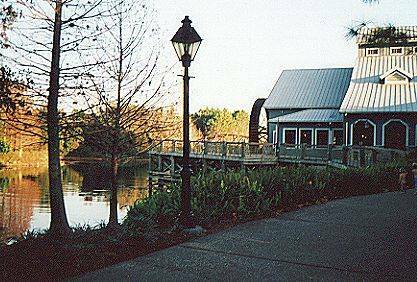 Alligator Bayou is rustic, with winding paths and walkways surrounded by trees and vegetation, while Magnolia Terrace is altogether more formal and spacious. Southern style mansions with fountains and lawns alongside the banks of the Sassagoula River. Both are lovely but some of the Bayou buildings are closer to the food court and main bus stop. Eventually India and Tammy surface. India is feeling a little better for her sleep so I take her to the food court where she feels up to eating some fruit. We meet the others on Ol' Man Island and India paddles her feet in the water. We have a family discussion to decide what to do for the rest of the day. My suggestion of visiting Hooters is rejected (can't think why) in favour of going to see Toy Story 2 at the cinema, after which Tammy and I will go on to Pleasure Island while Grandma will take the girls home for an early night. Just as we are about to set off India is sick again but immediately afterwards says she feels much better. I suspect that is because she doesn't want to jeopardise a trip to the cinema but we will see how it goes. We get the boat to Downtown Disney. This really is the most pleasant way of travel and the fresh air does India a lot of good. Toy Story 2 is excellent. It is unusual for a sequel to be better than the original. Tammy is very enthusiastic about it, which is a great compliment as it is unusual for her to be so upbeat about a film. I think it has something to do with when the second Buzz calls Hamm a slotted pig. This tickles her fancy for some reason and she keeps saying it all night, although I must say that I take exception to continually being called a pig. Just because I suggested a visit to Hooters, purely for educational purposes you understand, I am interested in the cultural differences in the approach our two countries take to the role of women in the workplace. What do you mean you don't believe me? I am hurt and offended that you would think that I could possibly have any other reason. We walk Grandma and the girls to the West Side bus stop with India looking a lot better. Hopefully a good nights sleep will put her right. Tam and I go on to Pleasure Island, starting out in the Comedy Warehouse. I have not seen this in many years and I enjoy it more than I remember. 'Improv' (God I hate that word) usually leaves me cold as I sometimes feel faintly embarrassed by the whole thing, but this is better than I expect. On to the Rock 'n Roll Beach Club. A very good band are playing to about 5 people. It is only 8:00 so that probably explains it. We leave for the Jazz club where we eat a cheese dip sort of thing while watching an excellent band called Blue Dice. A 4 piece brass section boosts the sound, I wouldn't call it jazz exactly, more blues. A visit to 8 Trax reminds us just how old we are and we beat a hasty retreat to the Rock 'n Roll Beach Club. the band are just finishing, so another beer and a couple of records later we are leaving for the bus stop. Another attempt to reach Islands of Adventure will be made tomorrow.